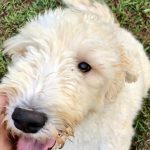 The Shepadoodle is a great doodle. 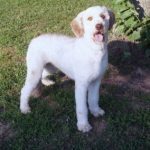 They are a mix with a German Shepard and Standard Poodle. Very smart, easy to train and make wonderful family and or service/therapy dogs. Size will be 40+ pounds with some reaching 80-100. They are truly a gentle, kind and loving dog. Double R Shantel is a lovely black and tan German Shepherd Dog. She stands 23 inches at her shoulder, weighing 60 pounds. She is friendly, eager to please, she has never shown an aggressive nature. We are looking forward to making F1 Shepadoodles with this beautiful girl!